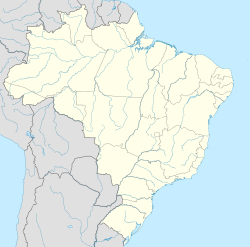 For ither uises, see São Paulo (disambiguation). Photo montage o the ceety o São Paulo. Frae the top, left tae richt: São Paulo Cathedral; Unitit Naitions Business Center; São Paulo Museum o Airt on Paulista Avenue; Paulista Museum; Bandeiras Monument; Octávio Frias de Oliveira Brig; an owerview o the historic dountoun frae Altino Arantes Biggin. "A am no led, A lead"
São Paulo is the lairgest ceety o Brazil, the lairgest ceety in the soothren hemisphere, an the warld's 7t lairgest metropolitan aurie. The ceety is the caipital o the state o São Paulo, the maist populous Brazilian state. The name o the ceety honors Saunt Paul. São Paulo exerts strang regional influence in commerce an finance as well as airts an entertainment. São Paulo is considered an Alpha - Warld Ceety. The ceety haes mony laundmerks, sic as the Paulista Museum, the neo-gothic Metropolitan Sé Cathedral, the São Paulo Museum o Airt (MASP), the Monumento às Bandeiras (Portuguese for Monument tae the Banner) an Niemeyer's Ibirapuera Bienal Complex; an mair recently the Octávio Frias de Oliveira Bridge (Estaiada Bridge) in the Sooth Side. Paulista Avenue, in Midtoun, is the ceety´s maist important financial center. The ceety is hame tae the São Paulo Stock Exchynge, or BOVESPA, the Future Markets, an the Cereal Market Stock Exchynges, the seicont lairgest stock exchynge in the Americas. São Paulo haes been hame tae several o the tallest buildins in Brazil, includin the Mirante do Vale Building an Itália Building. Wi an estimatit population o 11,037,593 residents athin an aurie o 1,523 square kilometers (588.0 sq mi), São Paulo is the maist populous ceety proper in the Americas. The ceety an aa lies at the centre o the hivily urbanized São Paulo metropolitan aurie, wi an estimatit 19,889,559 fowk in 2009 ower 7,944 square kilometers (3,067.2 sq mi), is the lairgest metropolitan aurie in the naition. São Paulo metropolitan aurie is ranked as the seicont maist populous in the Americas. Fowk frae the ceety o São Paulo are kent as paulistanos, while paulistas designates onyane frae the whole o São Paulo state, includin the paulistanos. The ceety's Latin motto, which it haes shared wi the battleship an the aircraft carrier named efter it, is Non dvcor, dvco, which translates as "A am no led, I lead." A famous nickname for the ceety is "Sampa." São Paulo is kent for its unreliable wather, the size o its helicopter fleet, airchitectur, gastronomy, an multitude o skyscrapers an aw. ↑ "Mirante do Vale, São Paulo". Emporis.com. Retrieved 2009-05-06. ↑ Instituto Brasileiro de Geografia e Estatística; Estimativas das Populações Residentes, em 1o. De Julho de 2008. Zip-file from ftp-archive. Estimated population of municipalities in Brazil on 2008-07-01. Retrieved on 2008-10-14. ↑ Instituto Brasileiro de Geografia e Estatística; Resolução No. 05, de 10 de Outubro de 2002, Área Territorial: UF – São Paulo – SP - 35 Pdf-file from ftp-archive. Areas of municipalities in São Paulo state. Retrieved on 2008-10-14. ↑ "Citimayors website — Largest cities". Citymayors.com. Retrieved 2010-04-17. ↑ Instituto Brasileiro de Geografia e Estatística; Estimativas das Populações Residentes, em 1o. De Julho de 2008. Zip-file from ftp-archive. Estimated population of municipalities in Brazil on 2008-07-01. 22,105,060 is the total population of the 39 municipalities within the official metropolitan area of São Paulo. Retrieved on 2008-10-14. ↑ Instituto Brasileiro de Geografia e Estatística; Resolução No. 05, de 10 de Outubro de 2002, Área Territorial: UF – São Paulo – SP - 35 Pdf-file from ftp-archive. Areas of municipalities in São Paulo state. Total area of the 39 municipalities within the official metropolitan area of São Paulo. Retrieved on 2008-10-14. ↑ Consejo Nacional de Población, México; Proyecciones de la Población de México 2005-2050[deid airtin] The total population o Zona metropolitana del Valle de México (Distrito Federal plus 60 ither municipalities) wis estimatit tae 19,826,918 in 2008. Retrieved 2008-10-14. ↑ "E São Paulo". Navios De Guerra Brasileiros. Brazilian Navy. Archived frae the oreeginal on July 3, 2008. Retrieved 2009-05-03. ↑ "International Relations – São Paulo City Hall – Official Sister Cities". Prefeitura.sp.gov.br. Retrieved April 17, 2010. ↑ "Les pactes d'amitié et de coopération". Paris.fr. March 17, 2010. Retrieved August 4, 2010. ↑ "Sister Cities". Beijing Municipal Government. Retrieved June 23, 2009. ↑ "Milano – Città Gemellate". 2008 Municipality of Milan (Comune di Milano). Retrieved July 17, 2009. ↑ "Os contatos internacionais do município de Limeira: pautas para o intercâmbio e o desenvolvimento" (in Portuguese). Revista Jurídica Netlegis. Retrieved March 24, 2010. ↑ "Naha Sister Cities". City.naha.okinawa.jp. Retrieved April 17, 2010. Wikimedia Commons haes media relatit tae São Paulo City.